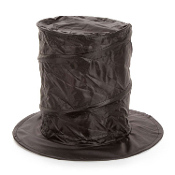 Large Full Size 10-inch (25cm) High Stove Top High Hat easily springs open from flat to full size. Quickly collapses flat again for storage or portable travel. If used for an outdoor snowman, be sure to attach well so the wind doesn’t carry it away! All you need is a carrot nose (we have a carrot, sold separately) and some eyes - coal, buttons whatever you like. Use your imagination! You can even add a scarf, corncob pipe, and a broom, if you like. Display on table with a bloody rabbit or body parts as a Halloween Haunted House Prop!